Common Suspension Problems & How To Spot Them! Roads are lined with endless bumps and cracks, and these are putting pressure on your suspension system. It’s the duty of your suspension to make your drive a smooth and steady one, but if you begin to notice that you have a rough ride, then you may need to consider having your suspension checked out. However, before you run to a mechanic, there are some signs to look out for, that will tell you whether or not your suspension is in fact damaged. So you decide to go for a drive one night, and when you thought it would be a smooth cruise, it actually felt like you were ‘cruising’ over a cobbled street. Well, that is one major sign of a suspension problem, when it feels like your entire vehicle is taking the impact of each dip and bump in the road. Now, if you look more closely at the suspension, it may be that you have worn shock absorbers. Shock absorbers, also recognised as dampers, ensure the tires of your vehicle remain constantly in contact with the road. Any time the tyre breaks contact with the road, your steering control and braking ability is compromised, as well as the comfort of your ride. 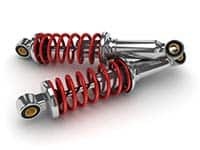 In the suspension, springs take all of the kinetic energy from the tires when you go over a flaw in the road, and that energy is then transferred to the shocks. The job of the shocks is to then disperse that energy evenly so that the car can stay steady when encountering cracks and bumps, rather than excessively bouncing up and down. A way to see if your shocks are damaged is to see if they look oiled, which is usually a sign that they are leaking fluid. A replacement is probably in order if you do spot this sign. The last thing you want is for handling your steering wheel to turn into an arm workout. So if you begin to feel this at even low speeds, opposed to the usual, relaxed and flexible handling, then you may be facing a suspension issue. Furthermore, experiencing the steering wheel ‘slipping’ back and forth, either when turning it or holding it in a turned position, can be presented as another problem. Firstly, when diagnosing the cause, it is best to eliminate any chances of it being due to bad wheel alignment or uneven tire wear. If everything with the tires checks out as fine, then you can start thinking that maybe it’s a power steering problem. A number of problems include low power steering fluid, a slack or damaged power steering belt or a damaged/leaking power steering rack. If you have an inkling that it may be any of these causes, then you should take your vehicle to a professional, who will establish what the issue is and handle it immediately. Often, the cause of pulling to one side when driving, is because of incorrect tire pressure. Whether they are over-inflated or under-inflated, driving with them like this for a long time could not only cause uneven tire wear but also further problems, such as poor wheel alignment, if not dealt with straight away. A sign to look out for when diagnosing poor wheel alignment is if your steering wheel sits a little asymmetrical. Also, if your tire treads look more worn in some areas than others or if you notice balding spots, then it’s likely that the cause of your car pulling to the side is incorrect wheel alignment. If your car pulls to one side when you brake, then you may have a problem with your brake caliper sticking. Hence indicating suspension problems. It’s not the best feeling hearing about having brake problems, but since it’s one of the most important parts of your car, any issues not dealt with can compromise your driving safety. When you apply the brakes, does your vehicle dip forward? 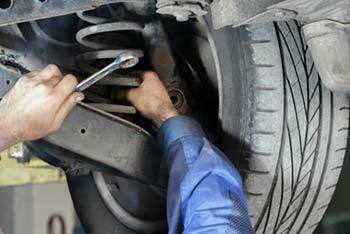 If so, then this may be due to worn out shocks or failing struts, depending on which one your suspension has. Experiencing this should alert you to get your suspension checked out, as this fault could essentially increase your stop time by at least 20% and you may even experience, in a worst-case scenario, a brief loss of steering. It’s always better to be safe than sorry. If you are stationary and on level ground, and you notice that one corner of your car sits lower than the other, then you may be dealing with a suspension issue. In a suspension system, the spring has the responsibility of providing the vehicle with balance by equally holding up each corner. The cause of one corner sinking is due to a damaged spring not being able to do its job. Confirmation of an injured spring will be if you experience difficulty when turning corners, if you hear strange clanging sounds when driving over defects in the road and if your vehicle bounces excessively when going over a bump. By carrying out a simple test, you can identify if springs or shocks are the sources of your problem. Situate yourself at either the front or back of your vehicle and push down, allowing the car to bounce up and down until it stops. If you count the number of bounces as over 3, then you will know that you need to consider having your suspension checked out by a mechanic. You know that thrill you get when you’re watching cars drifting around corners in Fast and Furious? Well, I don’t think it’s a thrill when it occurs in real life. In fact, it should worry you if your car either drifts or pulls around a corner, as the instability can be a sign of a defective suspension. Specifically, the anti-roll bar may be faulty. When operating properly, its function is to counteract the force of a turn and keep the car secure and steady, however if you drift around a corner and maybe even hear clattering sounds, you will need to get to a professional to see if there are any damages to the anti-roll bar and if it’s bushes or links may need replacing. You should make it a habit to pay attention to how your car drives and any little changes you may notice, as disregarding these symptoms could easily turn your daily commute into a dangerous accident. Deal with the issues as soon as possible, before the consequences of you ignoring them won’t just affect your car, but will also empty your wallet. Power Steering Services have been the UK’s #1 steering specialists since 1974 and we have a wealth of experience. If you feel your car is showing any signs of suspension issues, contact us to today to find out how we can effectively diagnose and repair those faults for you. Tags : How To Spot Suspension Issues, How To Spot Suspension Problems, Signs Of Suspension Issues, Signs Of Suspension Problems, Suspension Damage, Suspension Issues, Suspension Maintenance, Suspension Problems, Symptoms Of Suspension Issues.